How can you fit in everything you have to say about a place in 80 words. Is it enough to give a feel of the place and identify lasting impressions? SAHDandproud has decided to give it a try, with a linky for everyone who wants to join in. 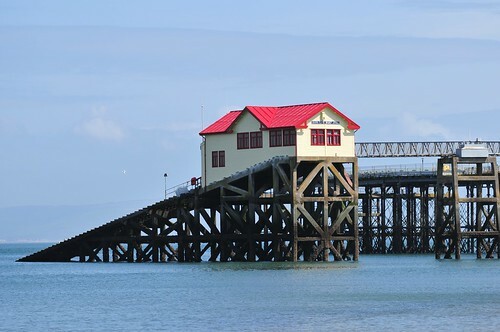 Lifeboat station with slide. Very impressive when boats shot down into the sea. Mumbles : land of my mother, coast full of beaches, soon to be defunct lifeboat station on stilts with fabulous boat slide into the sea. Previously famous for the mile of pubs. Still an old-world feel to it - visit boutique ‘Treasure’ there since my youth, full of up-market souvenirs and coffee shop. A magnet for artists, the area is of outstanding natural beauty. You can eat outstandingly too, like the lava bread gratin at Langland’s brasserie on the beach.